Below is an analysis of the Spring Meetings IMFC communiqué, which was issued on 13 April 2019. The IMFC is the direction-setting body of finance ministers for the IMF. The communiqué of the IMFC sets out the consensus position about the direction of the Fund and reform. The ministerial statements to the IMFC, often revealing of the true differences of opinion amongst the IMF’s membership, are also made available online. The next meeting will be held in Washington DC, on 19 October 2019. Mr. Lesetja Kganyago, Governor of the South African Reserve Bank, chaired the 39th International Monetary and Financial Committee (IMFC) meeting, and a full list of attendees can be found here. 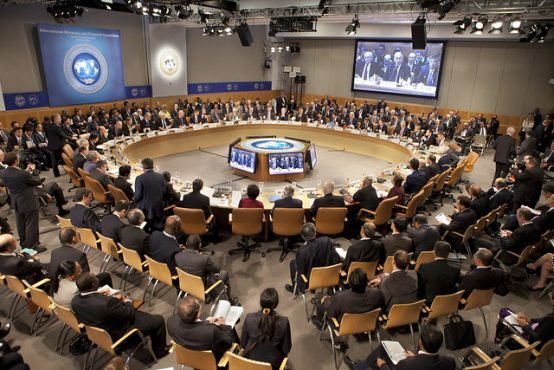 Reflecting the somber tone of the April 2019 World Economic Outlook (WEO), which noted that “after strong growth in 2017 and early 2018, global economic activity slowed notably in the second half of last year”, the IMFC communiqué opened by stating that global expansion continues, but at a slower pace than anticipated in October (see Dispatch Autumn 2018). Building on IMF Managing Director Christine Lagarde’s opening press conference remarks that, “we are now talking about a synchronized slowdown by 70 per cent of the global economy”, the communiqué noted that growth is projected to firm up in 2020, but risks remain tilted to the downside. Building on IMF Managing Director Christine Lagarde’s opening press conference remarks that “we are now talking about a synchronized slowdown by 70 per cent of the global economy” the communiqué notes that growth is projected to firm up in 2020, but risks remain tilted to the downside. The committee noted the IMF’s work to enhance debt transparency and the sustainability of financing practices by both debtors and creditors. While this focus will be seen as welcome, civil society has pointed to substantive problems with the current Debt Sustainability Framework (DSF), particularly in relation to its lack of debt relief and vague definition of sustainability (see Observer Winter 2017-18, Update 40). By the IMF and World Bank’s own admission, the DSF would still have missed 1-in-5 past crises – a point of particular concern as 33 out of the 68 countries assessed were in high risk of external debt distress or in distress (see Observer Spring 2019). Building on messages around climate change, domestic resource mobilisation, and energy scarcity, the communiqué stated, “We support efforts toward achieving the 2030 Sustainable Development Goals [SDGs].” This restatement of the commitment to the SDGs follows accusations from civil society that the IMF is merely using the SDGs as a public relations exercise to justify what it is already doing, no matter how incompatible this may be with truly equitable sustainable development (see Observer Spring 2019). As the IMF prepares to finalise its institutional view on social protection, the communiqué further noted that members look forward to the IMF proposing a strategy to more systematically engage on social spending issues – with the current approach having been heavily criticised for its failure to adhere to internationally agreed standards (see Observer Spring 2018). Pressure on the Fund to complete the quota review and address the democratic deficit has been mounting in the face of US efforts to block the reforms (see Dispatch Spring 2019). Following the G24 Spring communiqué, which cited the lack of progress on quota reform as a “major concern” (see Dispatch Spring 2019), the G24 October communiqué called on the Bank and Fund to “strengthen their efforts toward addressing the severe under-representation of some regions and countries, including at the managerial levels” (see Dispatch Autumn 2018). These calls from developing countries come in addition to senior Chinese officials urging progress on quota reform as well, as reported by Chinese news agency Xinhua. Ministerial statements responding to the Spring 2019 IMFC communiqué can be found here.